Carry your Metro vacuum and accessories in style! The Metro Soft Pack Dryer & Vacuum Carrying Case accommodates almost all of Metro's vacuum cleaners or auto dryers, with room to spare for carpet cleaners, brushes, and accessories. The stylish bag gives you an easy, organized way of transporting your Metro vac, whether you're a mobile detailer or hobbyist on the go! 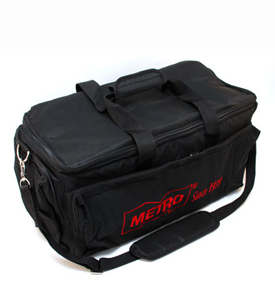 The Metro Soft Pack Dryer & Vacuum Carrying Case has soft sides to provide some cushion for the vacuum or dryer. Numerous, large pockets hold brushes, cleaners, vacuum attachments, and towels. The bag features an easy-access top opening. All Metro products fit in the Metro Soft Pack Dryer & Vacuum Carrying Case, with the exception of the Metro Wall Mounted Vac N Blo Sr.
Bring your Metro vac with you in the sharp-looking, well-made Metro Soft Pack Dryer & Vacuum Carrying Case. The Metro Soft Pack Dryer & Vacuum Carrying Case has an easy-access top opening. 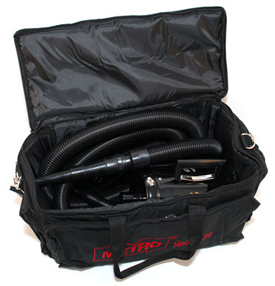 The Metro Soft Pack Dryer & Vacuum Carrying Case accomodates all portable Metro vacuums. Fits all my vacuum supplies also. If. You own the metrovac with its many use tools or you are a mobile detailer, this bag is essential in order to transport and keep track of its many parts.